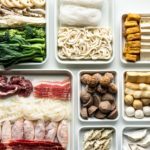 Making Chinese hot pot at home is easy – here's everything you need to know! One of my all time favorite meals growing up was Chinese hot pot. Or, as we called it, steam boat. I’m pretty sure my parents called it that to make it more fun for us, because boats are something that kids like? Anyway, we all call it hot pot now and it’s still one of my favorite things to eat on a cold and cozy night. Hot pot in Chinese is called huǒ guō (fire pot) or dǎ biān lú (fight the furnace). 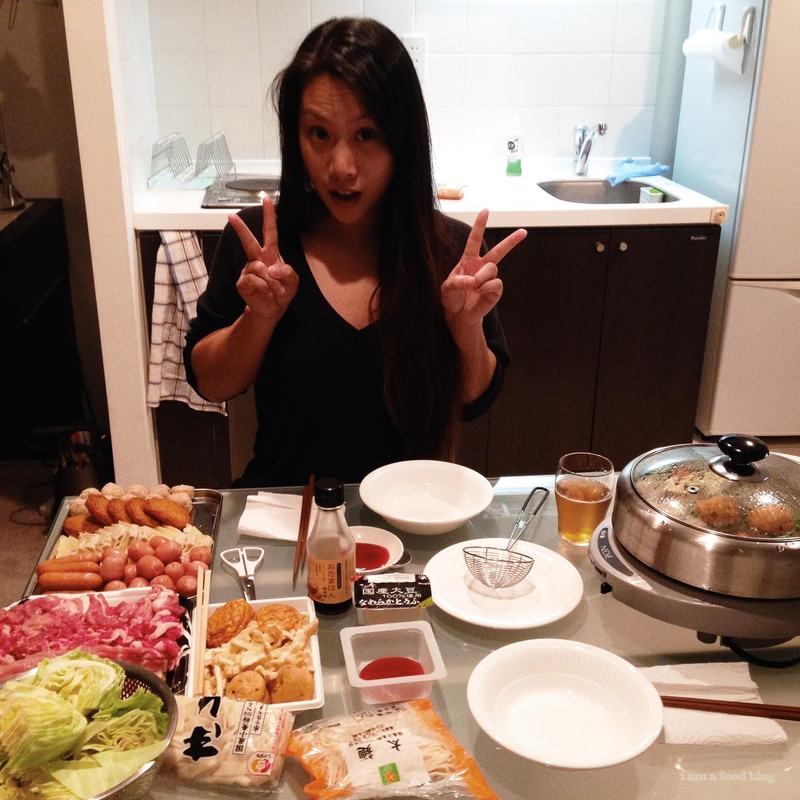 It’s a fun and filling way to spend the night eating and chatting because you’re literally hanging around a hot pot at the table where you cook and eat together. Hot pot happens to be the one meal that Mike and I eat the most, partially due to the fact it’s very easy to put together and partially due to the fact that Mike loves it so much. Essentially, all you do to prepare hot pot is make a broth that is simmered at the table in a, you got it, hot pot. You load up the table with a bunch of meats, veggies, tofu, seafood items, and noodles. Everything is cooked at the table, a la minute, scooped out of the pot, dipped into your own customized sauce and devoured. The theme of hot pot is, as Mike likes to say, “it’s your choice.” And it’s true, it is your choice. Don’t eat meat? Have an all veggie hot pot. Love seafood? Go heavy on the seafood. 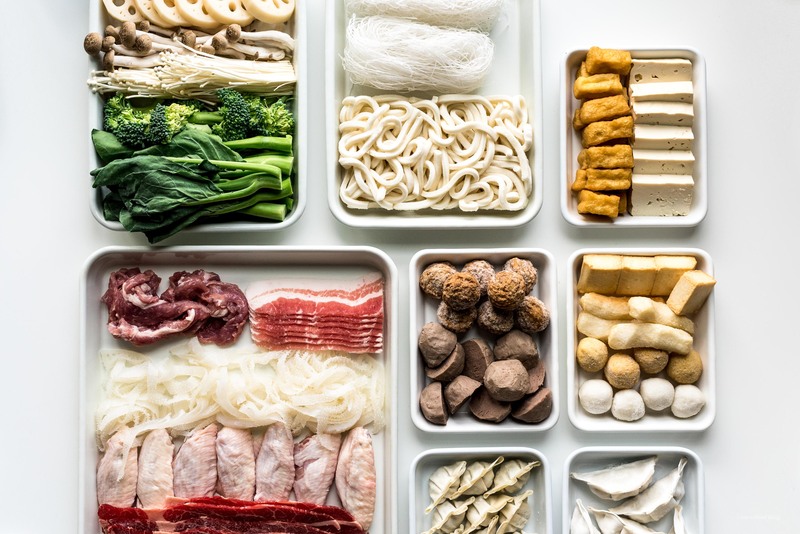 Really, hot pot is all about choosing your ingredients/what you’re going to put into your pot. 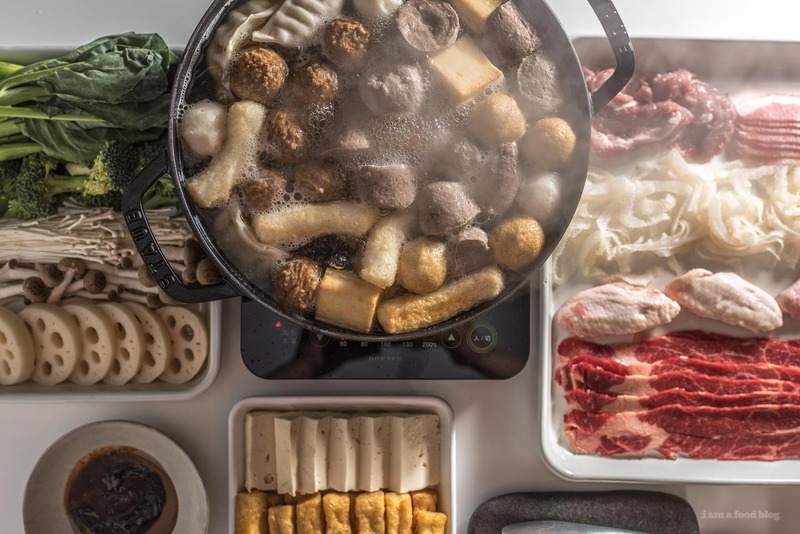 There’s a huge variety of hot pot, even within China – there’s mind numbing spicy hot pots, herbal hot pots, curry hot pots, plain hot pots, really there’s no wrong way. Here’s a quick guide to get you started. If you’re going to have hot pot, you’re going to need a hot pot! For the fire portion, there are several ways you can go: induction, gas, or a two-in-one. I say you go with whichever one you might already have, or if you are going to be buying something, I’d choose induction just because I’ve heard horror stories of gas canisters exploding (not to scare anyone!). 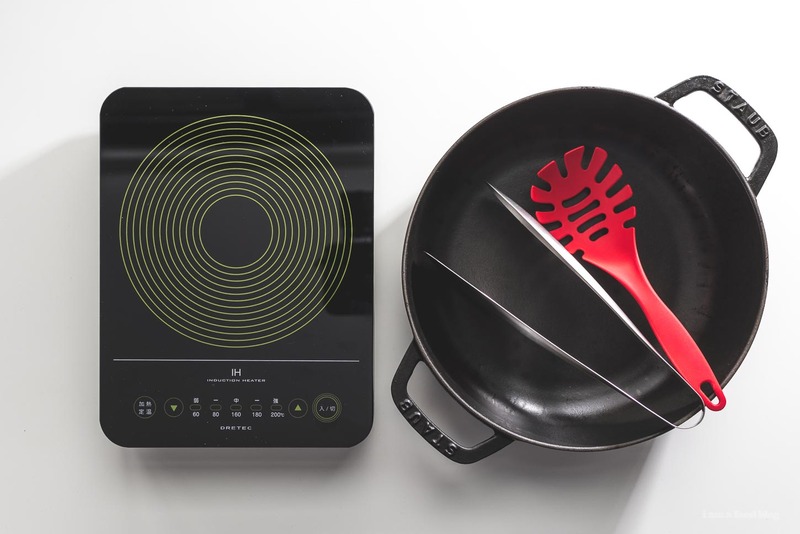 Induction is easy to clean – just wipe it down – and bonus, there’s no chance of it exploding. We’ve definitely used the two-in-one before too, but it’s just easier to use a pot you already have. Plus it’s easier to wash. Speaking of pots, you want one that’s shallow so your food isn’t drowning. You want to be able to see it floating in there so a deep regular saucepan isn’t going to cut it. Growing up, we always had the split pot so my parents could have spicy soup while me and my brother stuck to plain chicken stock. The split pot is great for people who want two kinds of soup or if you want to keep one side for meat and the other side for vegetables. There you have it, it’s essentially all you need! Mike and I like to use a portable induction cooker with our favorite cast iron shallow brasier. Oh wait, you’ll also need hot pot strainers (the little individual scoop-y thing you see in the photo), shallow dishes to hold your sauces, small bowls to eat out of, several pairs of tongs, chopsticks, and a ladle, if you are going to finish on broth. Meat, it’s what hot pot is for. 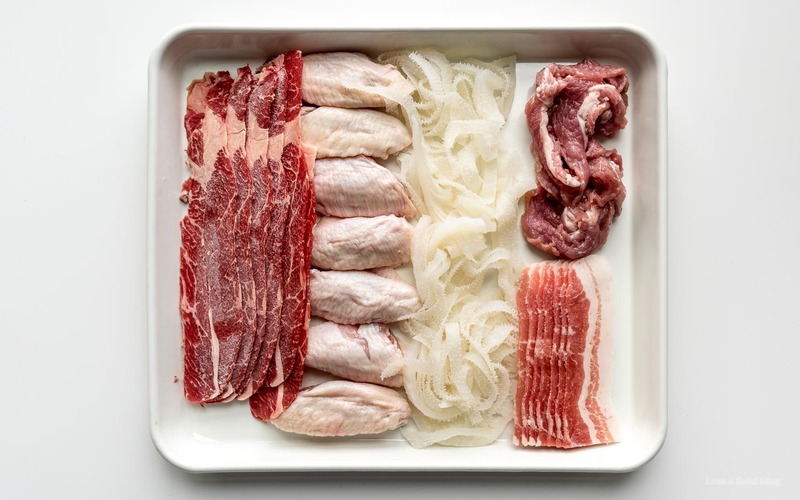 Essentially you can cook any kind of meat in hot pot, as long as it’s sliced thinly. You pop it into the boiling water, swish it around a bit (or let the pot come back up to a boil if you’re super scared of raw food), pull it out and eat it. 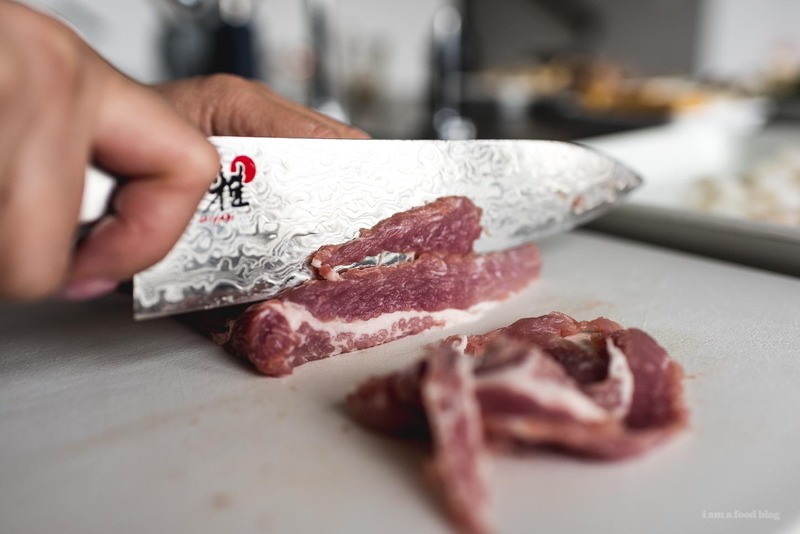 Typically thinly sliced beef, pork, and chicken is very popular. There are a variety of cuts that you can get thinly sliced in trays at your Asian grocery store – go wild and buy a bunch. Some of our favorites are: rib eye (on the left), pork belly (the bacon-y looking one), pork jowl, lamb shoulder, and pork shoulder. Or, if you like, you can DIY it! Pick pieces of meat that are heavily marbled and pop them in the freezer for about 30 minutes – it should feel slightly solid, but still yield, and then slice it as thinly as possible. Here I added in some chicken wings because I love wings – I’ll add those to the stock and simmer them for a while before we start hot potting everything else. Wings will take about 10-15 minutes so if you’re going to have them, just toss them in a simmer them before you start. We also have some tripe because that’s the good stuff! Remember, it’s your choice, so if you want to go with just one kind of meat, you can. Oh, and I didn’t include seafood here, but sometimes we’ll have shrimp, scallops, squid, and fish slices too. Suggestions: thinly sliced steak, pork shoulder, chicken, lamb shoulder, shrimp, scallops, squid, fish. Vegetables are Mike’s favorite part of hot pot – sometimes I think he could eat hot pot with just a head of lettuce! I like a bit more variety, so I usually include some sort of Asian vegetable (gai lan, as pictured) and mushrooms. Any leafy greens will work, as well as broccoli and cauliflower. Essentially, anything goes, just make sure you’re not over cooking your vegetables! Pop them in, let them cook, then pull them out immediately. No one likes sad, soggy, forgotten vegetables in the pot. 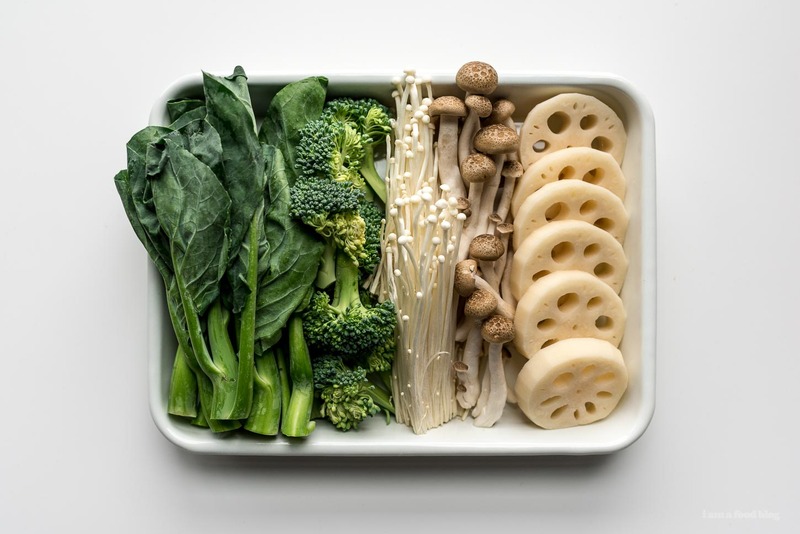 Suggestions: leafy greens like spinach, watercress, lettuce; cabbages like siu choi/napa, kole; mushrooms like enoki, shiitake, oyster; crunchy vegetables like broccoli, cauliflower, lotus root; starchy vegetables like potatoes, taro, sweet potato. This category is a straight up go to the Asian grocery store and raid the freezer section. You can make your own dumplings and balls, but the appeal of hot pot to me is that we always have a large selection of these guys hanging out in the freezer, just waiting to go. When you get to the Asian grocery store, you want to go to the frozen section or sometimes there will be a case beside the fish where fresh fish balls are. Fish balls, if you haven’t had them, are THE BOMB. They have the best texture and are not very fishy. They’re kind of hard to explain, but trust me, you’ll love them. I call them fish balls, but they come in all kinds of flavors: shrimp, squid, cuttlefish, lobster – if it swims, it comes in fishball form. I particularly like the “golden” ones because they’re deep fried. 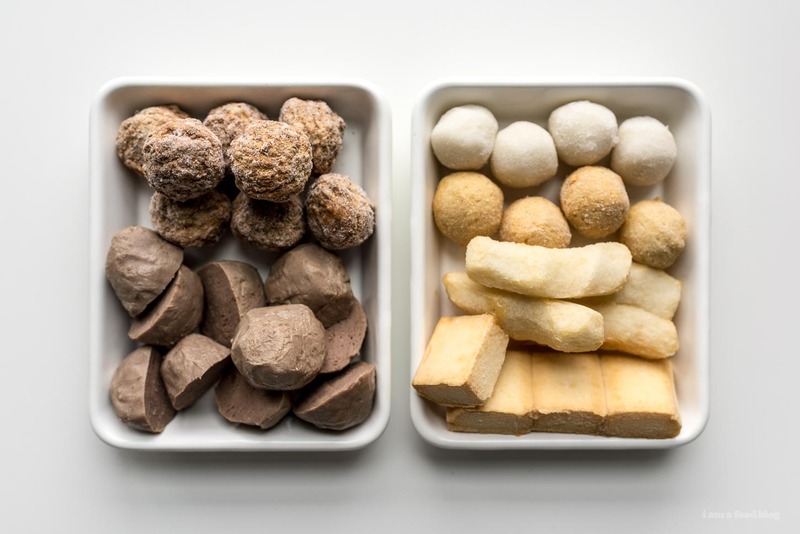 Sometimes they’ll even have fish balls with things inside, kind of like a dumpling, but with a fish ball wrapper instead of a dumpling wrapper. 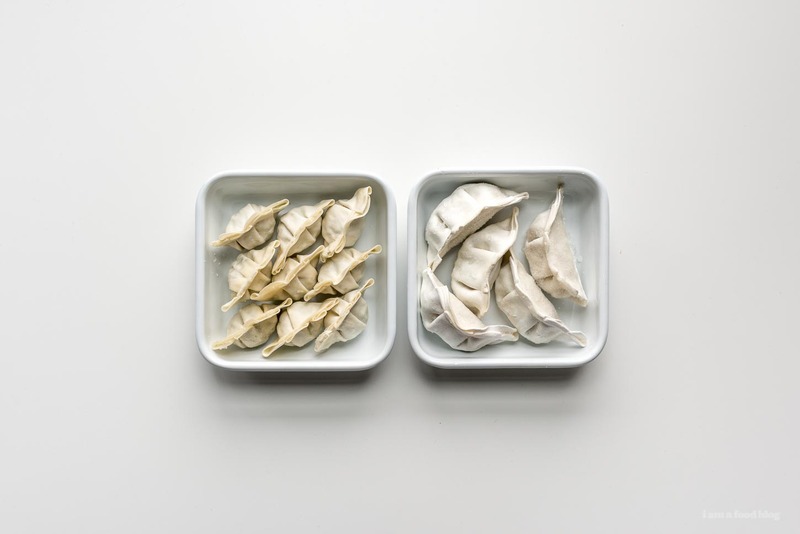 Speaking of dumplings, grab some frozen dumplings to put in your hot pot. I like to get the ones that are already fully cooked since you can’t really see inside them. That ensures that you don’t accidentally pull out a dumpling and bite into a raw filling. Get the classic pork and vegetable combo and if you see it, go for pork and corn, it’s my fave. Oh, and grab some meatballs too, they usually have these in the deli section – in our local store we have a selection of Vietnamese meatballs and I always grab some to throw in. Suggestions: golden fish balls, shrimp balls, cuttlefish balls, fish tofu (it’s the cube looking one and it’s good), Taiwanese fish tempura sticks (the ones that look like tubes), pork and vegetable dumplings, pork and corn dumplings, wonton, gyoza, Vietnamese beef balls, pork balls, pork and mushroom balls, essentially anything goes! I even threw in some frozen Ikea meatballs for good measure! Head to the tofu section and grab what tofu you love. Mike’s partial to mini tofu puffs and I like medium firm tofu. I also love egg tofu, the kind that comes in a tube. When you’re popping the tofu into the hot pot, it doesn’t need long, if you let it simmer for a while and forget about it, you might find that it’s disintegrated. Keep an eye on it, tofu is one of the best parts of hot pot. 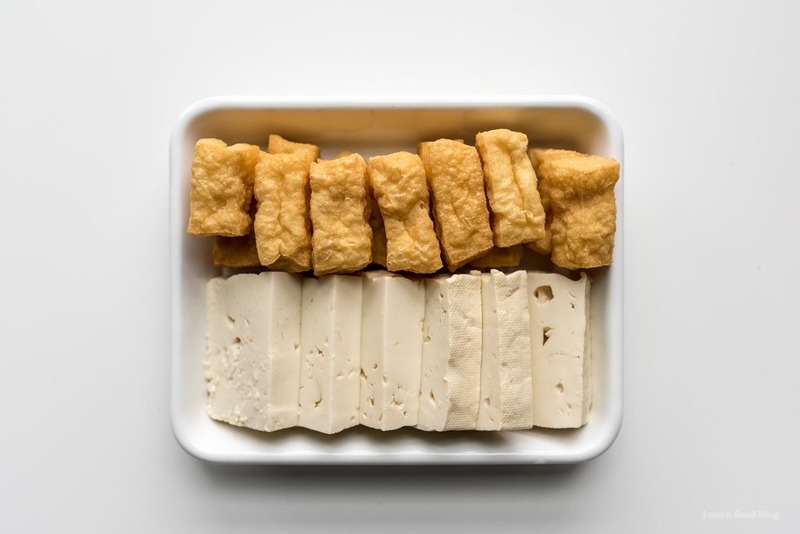 Suggestions: medium firm tofu, firm tofu, tofu puffs, pressed tofu, deep fried tofu, egg tofu. If I can wait, I like to add noodle at the end when the broth has had a chance to infuse itself with the flavors of everything that has been in the pot. I love noodles, so they’re essential. I usually go for udon because they’re thick and delicious, but mung bean noodles are excellent at soaking up flavor too. 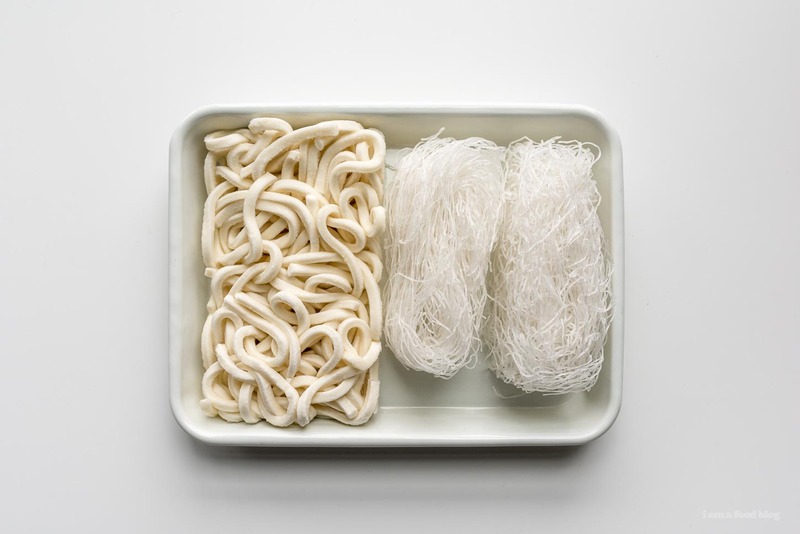 Suggestions: udon (get the frozen stuff, it’s way better than the vacuum packs), glass noodles/mung bean noodles. Here’s where the fun starts: the dipping. Everything that comes out of the hot pot is dipped in sauce. Well, maybe not the noodles, but you know, you can pour sauce on to those. Every family will have their own version of hot pot dipping sauce and everyone will have personal taste. So, just provide a bunch of sauces and let people mix and match. 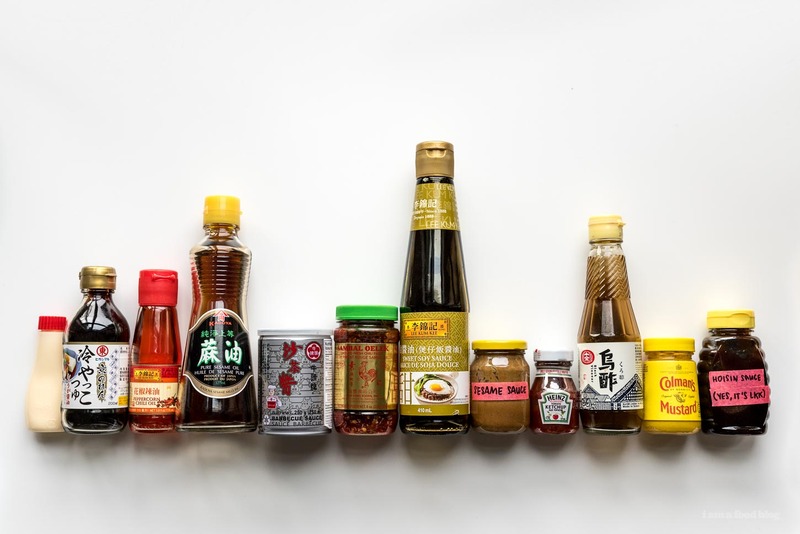 Growing up I just dipped in a simple sweet soy sauce with green onion and cilantro mix, but now I prefer a mix of Chinese sesame paste, hoisin sauce, sweet soy sauce, and shacha (Chinese barbecue sauce). If there’s a sauce that I think is always offered with hot pot, aside from soy sauce, it’s shacha. 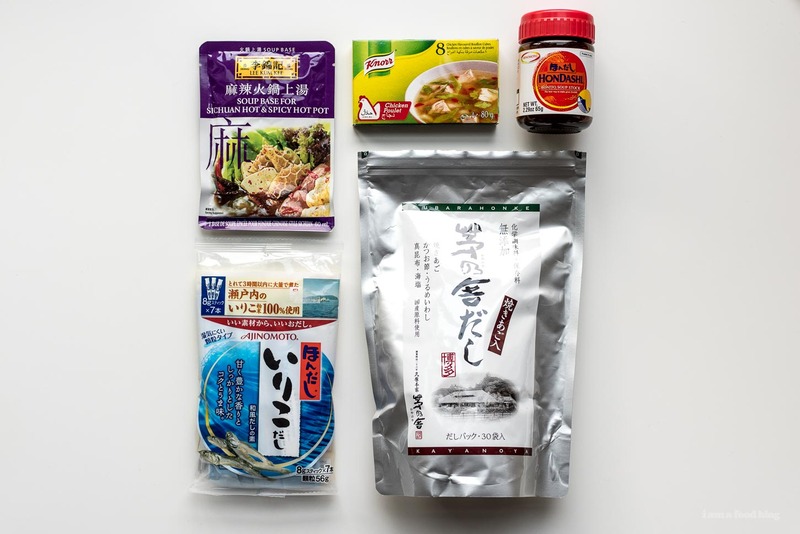 Shacha is made from soybean oil, garlic, shallots, chilis, brill fish, and dried shrimp. It’s an umami bomb and so so delicious. People typically mix it up with a bit of soy sauce, sesame oil, green onions, and cilantro. Some people also mix in a raw egg yolk for an extra bit of oomph. Mike’s favorite sauce is a mix of sriracha, ketchup, and sugar. It’s sweet, spicy, and delicious. Usually I just mix them up in equal parts, but feel free to fiddle around and make it your own if you try it. Alright my friends! You’re ready to go forth and hot pot. Set up your table with the heating element in the middle of the table, and put the pot of stock on. Place all the ingredients around the pot and let everyone cook and eat to their hearts content. Keep the pot at a simmer and when in doubt on if it’s cooked or not, you can let it go a little longer. Some people prefer to dump a bunch of things in, let it come to a boil and leave it to simmer while they pick things out and eat them and some people like to just put in the piece that they want to eat. Cook, dip, and eat away. PS – Happy Valentines! We’re having hot pot for our lil Valentine’s day together, so this post is especially fitting. PPS – It’s also fitting because Chinese New Year is coming up (February 16) and this would be the perfect meal to celebrate. PPPS – Last one, I promise! It’s I am a Food Blog’s 6th birthday today! Crazy how long we’ve been doing this for. If there’s anyone still reading this, thank you, thank you, THANK YOU for reading!!! I’m still reading and loving the blog! Been wondering for a while… could you use a slow cooker as a hot pot or is it not hot enough? Thanks! aw thank you so much amy!!! hahahahha i like ms yeah! This is amazing and you can customize it to everyone’s taste. Much like a fondue. Yum. I have in a pinch used a slow cooker. It’s not for large groups but for 2-4 patient people can work. Just plan on longer waits for the stock to reboil. Best solution is the white gas portable stoves in my opinion. Hotpot is so fun! I swear I can eat for hours and not even know it! Haha x_X Happy 6th birthday guys! So happy you guys are around to show us good eats <3 love you guys ! I am super excited to try this! I teach English online to kiddos in China, and one family keeps telling me about this. I want to try it and make a video for them! Plus I think my hubby will like it, even tho he and I eat very differently. Thanks so much for the recipe. Wish me luck! I just wanted to thank you for the time it took you to explain in detail the steps and options. I was nervous about going to our Hmart to look for some ingredients since our local grocery doesn’t have many of the items I’m looking for. Thank you for providing pictures so I can be more confident when I go!! !